Astronaut Mark Kelly, the husband of wounded Congresswoman Gabrielle Giffords, announced today (Feb. 4) that he will remain commander of the space shuttle Endeavour's upcoming final mission to the International Space Station. Endeavour is slated to liftoff from Launch Pad 39A at Kennedy Space Center at 7:48 p.m. EDT (2350 GMT) on April 19, 2011. Why was Mark Kelly's presence on the mission in doubt? For a time, there was some doubt as to whether NASA astronaut Mark Kelly's would remain as commander of Endeavour's STS-134 flight, or whether he would choose not to fly on the mission at all. Kelly's wife, Congresswoman Gabrielle Giffords, suffered a gunshot wound to the head in an assassination attempt Jan. 8 at a constituent meeting in Tucson, Ariz. Since then, Kelly had been debating whether to go through with the mission or stay by his wife's side as she recovers. In a press briefing today (Feb. 4), Kelly announced that he would remain part of the STS-134 crew. He told reporters that his wife is making incredible progress in her recovery, and that ultimately, she would want him to carry on with the mission. Kelly and Giffords have been married since 2007. How long is the STS-134 mission? Endeavour's final mission to the space station is scheduled to last 14 days. Four spacewalks are planned. The STS-134 mission is the second-to-last space shuttle flight planned before NASA retires its three-orbiter fleet later this year. NASA plans to fly one last mission aboard the shuttle Atlantis to deliver supplies to the space station, but funding for the mission has yet to be approved by Congress. 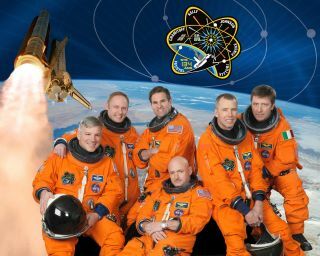 There are six astronauts who make up the STS-134 crew: commander Mark Kelly, a veteran of three previous shuttle flights; pilot Gregory Johnson, who piloted Endeavour on the orbiter's STS-123 mission in March 2008; mission specialists Michael Fincke, who has served two long-duration stints living and working onboard the International Space Station; Greg Chamitoff, who has logged a total of 183 days in space; Andrew Feustel, who was a member of the shuttle Atlantis' STS-125 mission in May 2009; and European Space Agency astronaut Roberto Vittori, who has flown twice before to the space station. Wasn't there a backup plan to replace Kelly? On Jan. 13, NASA made an unprecedented announcement that veteran spaceflyer Rick Sturckow would serve as backup commander during ongoing training for Endeavour's STS-134 flight. Sturckow stepped into the backup seat for Mark Kelly, as Kelly tended to his wife, who was in critical condition in a Tucson, Ariz. hospital at the time. Kelly's announcement of his intention to fly on the upcoming mission means that he will now rejoin his crewmembers and continue training. Endeavour's two-week mission will deliver supplies, spare parts and new hardware to the International Space Station, including two communications antennas, a high-pressure gas tank, additional spare parts for the station's robotic arm, and micrometeoroid debris shields. The shuttle will also deliver a $1.5 billion astrophysics experiment called the Alpha Magnetic Spectrometer (AMS). This state-of-the-art cosmic ray particle physics detector is designed to examine fundamental issues about matter and the origin of the universe. The AMS will be attached to the space station and will look for signs of antimatter, dark matter and cosmic rays beyond the Milky Way. Wasn't Mark Kelly's brother, Scott Kelly, also involved in this space shuttle mission? Kelly's twin brother, Scott Kelly, is also a NASA astronaut. Scott Kelly is currently living and working onboard the International Space Station as commander of the space station's Expedition 26 mission. Originally, the timing of the space shuttle flights was such that the two brothers were set to meet up in space. But, delays to the flight ahead of Endeavour – the shuttle Discovery's STS-133 mission – have altered NASA's launch schedule.Scott Kelly is due to land back on Earth March 19, a month before his brother will launch on Endeavour.